✓ Private meet and greet at the Juan Santa Maria (San Jose) International Airport. ✓ Services of your private naturalist guide, Rudy Zamora (35+ years of birding in Central America) 24/7 in-country assistance. ✓ Birding checklist and target list customized to each location. ✓ Daily recap every day with your guide to update your birding checklist. ✓ 1 group leader travels for free with 12 full fare guests. Arrive at the Liberia Airport, where you will be met by your private guide. Your journey begins with a 1.5-hour drive to the Palo Verde Research center. This 50,000-acre National Park has seasonally dry forest and extensive wetlands. The intense number of bird species in the area makes up for the modest accommodations. Keep your binoculars ready as you will have great chances for the thicket tinamou, long tail manikin, vireos, orioles, and the jabiru stork. Today you will spend the day exploring the dry forest and wetlands. You will combine hiking, and driving and possibly even a boat ride to search out all the target species in the area. After a full day of birding (with breaks for meals on site) you’ll have time to relax at dinner and update your checklists. This evening, you will spend time around the station searching for owls, potoos, and night jars. (plus, all the other night creatures of the rainforest). After breakfast, continue your adventure traveling northeast to the Caribbean Lowlands. You will drive about 3-hours to the station. Weather permitting you will stop at the Tenorio National Park to look for the pied-puff bird, tody motmot, black & yellow tanager (among many other species) and then continue to La Selva. La Selva is comprised of 3900 acres of tropical forest nestled between two rivers. (Rio Puerto Viejo and Rio Sarapiqui) La Selva was established in 1954 as a farm dedicated to natural resource management. In 1968, it became a private reserve and research station owned and operated by the O.T.S. More than 250 scientific papers are published yearly with research and study done and completed at La Selva. The accommodations are simple and the food basic, but the birding and wildlife viewing is without compare. From the moment, you step out of your room, you will be collecting species at La Selva. The gardens surrounding the lodge are teeming with bananaquits, red-legged honeycreepers, hummingbirds, and toucans. You will spend the day exploring the vast trail system throughout the station. Keep your eyes peeled for the snowy Cotinga, black-striped woodcreeper, tiny hawk, and the little tinamou. Today you will depart the steamy Caribbean lowlands and head for the highlands of the Talamanca Mountains. Enroute, you’ll stop at the famed La Paz waterfall gardens to walk the trails, view the waterfalls, and enjoy a tasty lunch. Your total drive time is about 3 hours. Note the change in temperature (have a sweater handy) and a vast difference in the surrounding fauna as you enter the gorgeous white oak forests of San Gerardo de Dota. Your riverside lodge has gorgeous gardens and comfortable accommodations. This area is the prime location for the resplendent quetzal, the flame-throated warbler, and the red-headed barbet. (to name just a few). A full day of birding at the private reserve of Savegre Lodge. You will walk the trails and be entranced by the beautiful white oaks, and golden moss of this stunning forest. The array of bird species is astounding. In the afternoon, stroll along the river looking for dippers, and phoebes and relax in the gardens surrounded by hummingbirds as the sunsets. Today you will travel south to the area of San Vito and the Las Cruces Biological Station (home of the famous Wilson’s Gardens). You will journey about 3.5 hours (birding as you go) and make a stop at Los Cusingos Sanctuary, the home of Alexander Skutch. Las Cruces is a mid-elevation site exuberant with vast collections of gingers, ferns, and bromeliads. Wilson’s Gardens has the second largest palm collection in the world. It’s not just about plants! Las Cruces has fantastic birding too. You will want to be ready to spy the speckled tanager, bran colored fly-catcher and the turquoise Cotinga. Accommodations are very simple, and meals basic but the flora and fauna are spectacular. Few places in Costa Rica boast the diversity and grandeur of Carara National Park. It’s a key location as a wildlife corridor between northern and southern Costa Rica creates a sanctuary for a huge variety of animals and birds. More than 400 species are possible in this region. The fertile Tarcoles river, famous for its massive crocodiles flows through the region bringing in shore birds and sea birds as well. Keep watch for tinamous, manakins, and puffbirds (just to name a few). 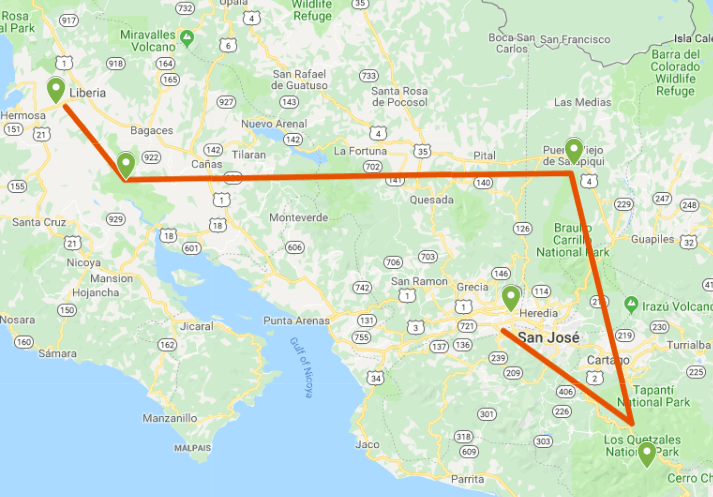 It’s about 5.5-hours drive back to San Jose but you will make plenty of stops along the way to view many bird species along the way. You will stop along the coast for a lovely ocean view and a delicious lunch. You will arrive late afternoon to your hotel. Plan on a celebratory farewell dinner that evening. The birding adventure comes to a close. Return to the San Jose Airport for your flight home. 100% privacy - We will never spam you or share your information!